A Summertime Wedding is one of the dreamiest adventures for a bride. It is also grounds for some of the most magical childhood memories of an exuberant flower girl. These lovely flower girl dresses capture the special feeling of being that one special princess who inspires the day with her innocence and grace. 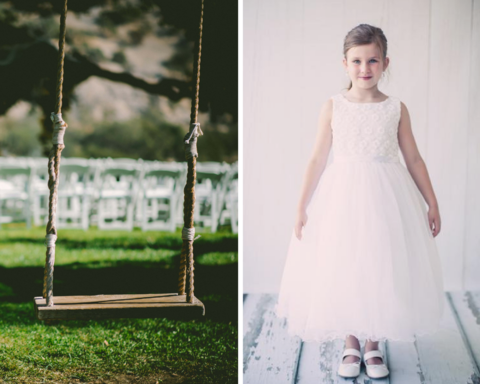 Grandma’s Little Darlings became inspired by these Flower Girl Dresses and tapped into our own inner flower girl to take on the summer adventure of wedded bliss and all of the awesome summer ideas that play into our inner flower girl’s dream wedding. 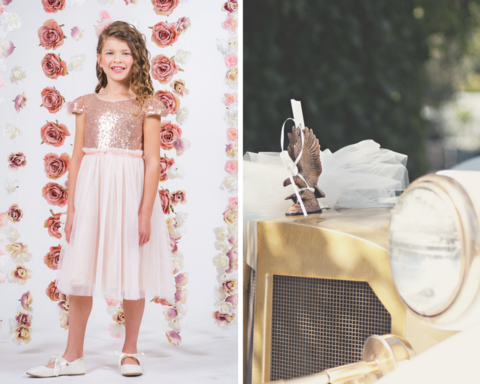 Whether the celebration is beachside, outdoor, or a combination of indoor and outdoor we love day dreaming up the perfect wedding ideas to make for a fairytale come true and the dreamy flower girl dress ensembles to match. 1. The Great Gatsby Summer Flower Girl Dress. Arrive in style with a summer inspired Great Gatsby wedding. In a proper 1922 themed Long Island Vintage wedding, elegance and timeless beauty will be the focus theme for a dreamy ceremony. Enjoy the excitement of a mysterious billionaire and walk down the aisle in high-class life with debutantes in the making. It’s so easy to achieve the perfect classy flower girl look with this adorable Flower Girl dress Sequined Mesh Pleated Dress. A flowy flapper feel with mesh trim at the neckline, perfectly pleated waist and the show stopping sequin bodice with cap sleeves. Any flower girl wearing this will feel right in the middle of a perfect Great Gatsby fairytale summertime wedding. What says summertime love and wedding fairytale like being whisked away into the clear blue skies? 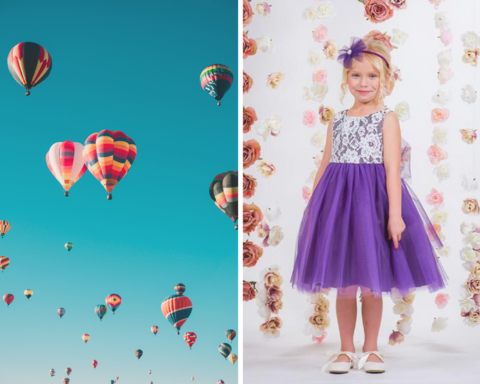 Our inner flower girl loves the freedom and adventure of a wedding day that stands out from the ordinary with a hot air balloon. Love is truly in the air and the colors that adorn a funtastic day can be mixed and matched to the colors of your wedding. Your adventure awaits and your Flower Girl dress can match in a variety of colors: dusty rose, aqua blue, champagne, green, purple and even yellow to add a burst of color to your summertime dream wedding. Staying elegant, your flower girl will adorn a beautiful bridal lace bodice with four layers of illusion tulle for a full volume skirt that is complete with a sash that can be made into a festive bow. A fairytale isn’t complete without a horse to gallop upon. Horses are mythical and magical. They represent freedom, nobility, trusting relationships and give us an opportunity to add a completely natural and grounding component to our most special occasion. Our inner flower girl can’t wait for the magical fairytale horse wedding to toss her pedals and contribute to the natural beauty of the perfect wedding. Horses are a magnificent alternative to an automobile wedding arrival where you can make a grand entrance and take advantage of the picture perfect photo shoot opportunity. 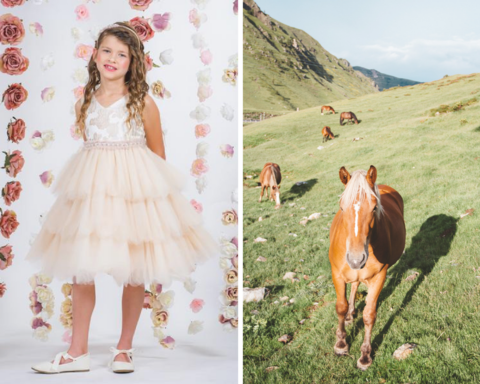 Whether you host your wedding at a horse ranch or you allow guests to take a magical ride, you will be sure to capture the heart of the day with a gallant steed and these glamorous flower girl dresses to match. This magical equestrian wedding look is easy to achieve when you giddy-up your flower girls in a Rose Bocade 10 Layer Vintage Flower Girl Dress. In either Vintage Rose or Off-White, this Flower Girl Dress comes accented with a matching pearl mesh trim and sash that elegantly tightens in the back. Another whimsical opportunity where you can adorn a swing with flowers and garland and have a perfectly summery dream wedding component to add to a day of love and play. Flower girls in a tree swing are some of the most adorable candid wedding photos. Having a set of tree swings at your wedding adds a layer of playful levity, brings the fun into the moment, and creates a blissful atmosphere. 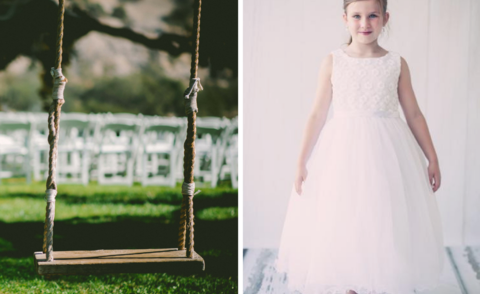 A tree swing can take a timid flower girl and transform her into a brave little princess, full of fun and smiles as she walks down the isle to spread her cheer. This swingy elegance can be reached with a Flower And Tulle Girls Dress complete with 3 Layers of Tulle Lace and a Satin Sash. 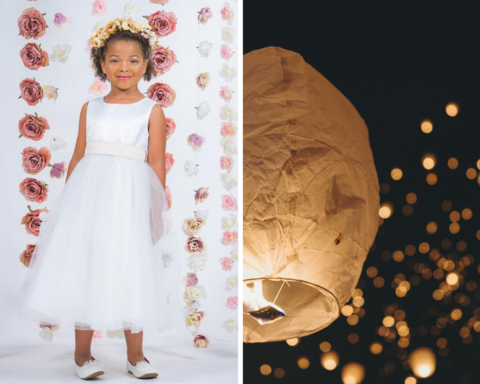 Watch your dreams take flight with flower girl inspired dreamy and romantic send off wish lanterns. Symbolizing luck and prosperity, sky lanterns are an enchanted way for newlyweds to watch their unity light up the summer sky. It’s a blissful feeling to lift your wishes up into the night’s sky for a summer evening of eternal love. Our romantic send-off and Flower Girl inspired Petal Flower Girl Dress comes customizable in over 20 sash colors and adds the right touch to an elegant and magical evening finale to your wedding.